Today is the anniversary of the day the machines took over. 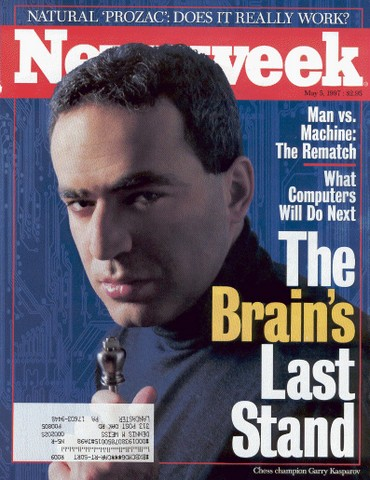 Exactly twenty years ago today, on May 11, 1997, the great chess grandmaster Garry Kasparov became the first chess world champion to lose a match to a supercomputer. His battle with IBM’s “Deep Blue” was a highly-publicized media spectacle, and when he lost Game 6 of his match against the machine, it shocked the world. At the time, Kasparov was bitter about the loss and even expressed suspicions about how Deep Blue’s team of human programmers and chess consultants might have tipped the match in favor of machine over man. Although he still wonders about how things went down behind the scenes during the match, Kasparov is no longer as sore as he once was about losing to Deep Blue. 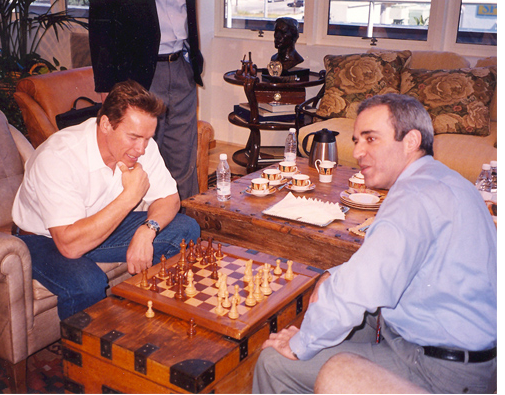 Instead, Kasparov has built on his experience that fateful week in 1997 and learned how he and others can benefit from it. The result of this evolution in his thinking is Deep Thinking: Where Machine Intelligence Ends and Human Creativity Begins, a book which serves as a paean to human resiliency and our collective ability as a species to adapt in the face of technological disruption, no matter how turbulent. Kasparov’s book serves as the perfect antidote to the prevailing gloom-and-doom narrative in modern writing about artificial intelligence (AI) and smart machines. His message is one of hope and rational optimism about future in which we won’t be racing against the machines but rather running alongside them and benefiting in the process. There is certainly no shortage of books and articles being written today about AI, robotics, and intelligent machines. The tone of most of these tracts is extraordinarily pessimistic. Each page is usually dripping with dystopian dread and decrying a future in which humanity is essentially doomed. As I noted in a recent essay about “The Growing AI Technopanic,” after reading through most of these books and articles, one is left to believe that in the future: “Either nefarious-minded robots enslave us or kill us, or AI systems treacherously trick us, or at a minimum turn our brains to mush.” These pessimistic perspectives are clearly on display within the realm of fiction, where every sci-fi book, movie, or TV show depicts humanity as certain losers in the proverbial “race” against machines. But such lugubrious lamentations are equally prevalent within the pages of many non-fiction books, academic papers, editorials, and journalistic articles. Given the predominantly panicky narrative surrounding the age of smart machines, Kasparov’s Deep Thinking serves as a welcome breath of fresh air. The aim of his book is finding ways of “doing a smarter job of humans and machines working together” to improve well-being. Chess fans will enjoy Kasparov’s overview of the history of the game as well as his discussion of how the development of computing and smart machines has been intermingled with chess for many decades now. They will also appreciate his detailed postmortem of his losing battle with Deep Blue, which makes up the meat of the middle of the book. But what is important about the book is the way Kasparov draws out lessons about how the game of chess and chess players themselves have adapted to the rise of smart machines over time — just as he had to following his historic loss to Deep Blue. The End is (Always) Near! Fears of sectoral disruptions and job displacements are nothing new, of course, and many of them have even proven legitimate, Kasparov notes. He discusses “a pattern that has repeated over and over for centuries,” in which humans initially scoffed at the idea of machines being able to compete with them. “Eventually we have had to concede that there is no physical labor that couldn’t be replicated, or mechanically surpassed.” That includes the game of chess, where smart machines are now superior to the world’s best players. That is why it is essential, Kasparov argues, that we not waste time trying to avoid these changes altogether. He regards the very idea of it as an exercise in futility. “Fighting to thwart the impact of machine intelligence is like lobbying against electricity or rockets,” he says. Instead, he argues, we must look to adapt, and do so quickly. Instead of just throwing our hands up in the air in frustration, we must be willing to embrace the new and unknown — especially AI and machine-learning. “Each of us has a choice to make: to embrace these new challenges, or to resist them.” His consistent plea throughout the book is to not give into to our worst fears, but instead to embrace these new technological challenges with a willingness to try new ways of doing things. “No matter how many people are worried about jobs, or the social structure, or killer machines, we can never go back,” he concludes. Kasparov is particularly concerned about how a deep underlying conservatism and resistance to experimentation has become a chronic problem within the traditional educational system. “The prevailing attitude is that education is too important to take risks. 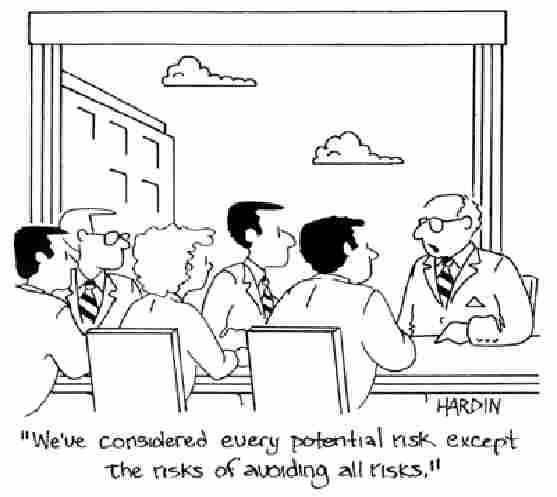 My response is that education is too important not to take risks,” he says. He is probably right. After all, as I have noted in recent essays, we increasingly live in a world where “global innovation arbitrage” — i.e., the increasingly frictionless movement of innovations to jurisdictions that provide a legal and regulatory environment more hospitable to entrepreneurial activity — is increasingly easy. We already know how challenging it is to control data flows in the age of the Internet, smartphones, and social media. But the combination of more sophisticated forms of machine-learning and the rise of innovation arbitrage opportunities means that formidable challenges lie ahead in terms of digital privacy and cybersecurity. He agrees with many other pundits that new skills and jobs will be needed going forward, but admits they aren’t always easy to plan for in advance. As Yogi Berra once famously said, “It’s tough to make predictions, especially about the future.” Indeed, as I pointed out in the most recent edition of my book Permissionless Innovation, when one looks back at official government labor market studies and forecasts from the 1970s and 1980s, you are struck by the way in which policymakers didn’t even have a vocabulary to describe the jobs and skills of the present. For example, you find no mention in past reports of some of today’s hottest jobs, such as software engineers and architects, UX designers, database scientists and administrators, and so on. On one hand, therefore, pessimistic pundits and policymakers regularly underestimate the adaptability of workers and the evolution of new skills and professions. On the other hand, they make an equally egregious mistake when they overestimate the impact of technological change on many sectors and professions, or suggest that mass unemployment is just around the corner unless we slow automation down. What Kasparov is really doing throughout the book is making the case for building human and institutional resiliency through a constant willingness to experiment and learn through trial and error. It is certainly true that many of today’s skillsets, professions, and business models will be challenged by the rise of smarter machines and algorithmic learning. Defeatism in the face of that prospect, however, isn’t the answer; adaptation is. Boston University economist James Bessen wrote about this process in his new book, Learning by Doing. 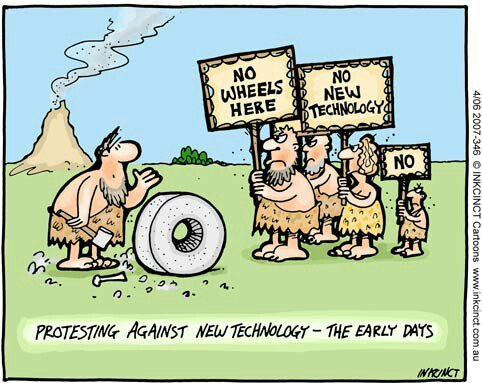 Bessen argued that periods of profound technological change require a willingness by workers, businesses, and other institutions to adjust to new marketplace realities. For progress to occur, large numbers of ordinary workers must acquire new knowledge and skills. However, “that is a slow and difficult process, and history suggests that it often requires social changes supported by accommodating institutions and culture,” Bessen notes. Luckily, history also suggests that we have been through this process many times before and can get through it again — and raise the standard of living for workers and average citizens alike over the long-run. The crucial part of that process is a general willingness to continue to experiment with new ways of doing things — i.e., learning by doing — and understanding that new skills and professions will emerge from all that process. What about more specific public policy solutions? Considering the unclear future that lies ahead, flexibility and plenty of policy experimentation will be crucial to finding and unlocking new methods that could help us cope and adapt in the new world. “The problem comes when the government is inhibiting innovation with overregulation and short-sighted policy,” Kasparov says. Trade wars and restrictive immigration policies won’t help matters either, he argues, because they “will limit America’s ability to attract the best and brightest minds.” Hopefully the Trump Administration is listening to his advice in this regard. AI skeptics and other technology critics will lament Kasparov’s lack of greater detail and the absence of a more precise blueprint for helping workers and institutions navigate an uncertain future. But, again, the entire point of Kasparov’s book is that there is enormous value in the very act of confronting those new challenges, learning through trial-and-error (including the many accompanying failures), and “muddling through” over time. Wise advice from the greatest of all grandmasters.